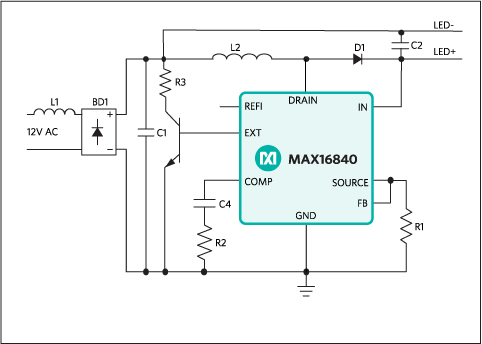 Create a design and simulate using EE-Sim® tools: The MAX16840 is an LED driver IC for lighting applications. 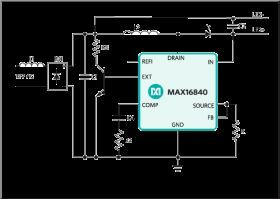 It includes all the necessary features to design low-component-count LED drivers for 12V AC and 24V AC input (e.g., MR16) light bulbs. A proprietary input-current control scheme allows LED lamps based on this device to be compatible with electronic transformers, and dimmable with standard trailing-edge dimmers (where electronic transformers are present). The IC can be used in buck, boost, and buck-boost topologies and features. It has an integrated 0.2Ω (max), 48V switching MOSFET. The IC uses constant-frequency average current-mode control. It senses the input current through the voltage at the FB pin, and regulates its average. An input pin (REFI) allows the setting of the input-current level. When the voltage at this pin is set below a certain threshold, the input current is proportional to this voltage, while when that voltage is beyond the threshold, the input current is set at a fixed, predefined level. This nonlinear behavior of REFI allows its use to achieve thermal foldback, by connecting it to an NTC resistor. The IC also features an internal overvoltage protection on the IN pin to protect the internal switching MOSFET from damage if the LED string is open or if the voltage on the LED string is too high. The IC has a separate EXT pin that can be used to guarantee that there is a kick-start of current at turn-on for low-input voltages for proper operation with electronic transformers. EXT drives an external npn transistor. Once the UVLO threshold of 5.5V is crossed on IN, EXT is pulled to ground and the external npn transistor is turned off. The IC is available in a 3mm x 3mm, 10-pin TDFN power package, and is rated over the -40°C to +125°C operating temperature range.